A laminitis diagnoses can feel like the end of the world, but trust me, it’s really not! I remember being terrified when my older horse was first diagnosed with laminitis. Even though there’s no cure for it, that doesn’t mean it has to ruin your horse’s life. 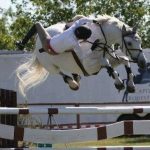 In fact, a good vet and farrier can help your horse manage symptoms and reduce flair ups while enjoying a high quality of life. I was up until midnight crying last night, silently sniffling into my pillow trying not to wake my light-sleeping lover. It didn’t work. My fiancé woke more than once to mumble, “It’s okay.” He didn’t even have to ask what was wrong. He already knew it was Aspota. My farrier just informed me that my favorite old horse Aspota has full-blown laminitis, also known as founder, in his left front hoof. I cry about Aspota on a regular basis, nothing has to be wrong at all to provoke tears. I just start thinking about how old he is, and how much I love him, and how I will so desperately miss him in every way when he dies. I will miss how he attacks me with his nose for carrots, rubs his head on my back (like all of the time), whinnies really loud like a little girl… I could go on forever because there are just so many unique things about him I delight in. Did I mention I’ve been crying over him since he turned 20? For point of reference, he’s 26 now. At least back then I could ease my worries knowing I had years left with him when he was 100% healthy and sound. Last night I had justifiable reason to be crying, after all laminitis is no small deal. Especially when added to Aspota’s list of other health problems: a heart murmur, stomach ulcers, tendency to colic, and the fact it’s getting progressively harder to keep weight on him. Aspota hanging out in the arena earlier today. My horse’s farrier called me about 7-weeks ago, the last time the boys got new shoes. He let me know he put a pad on Aspota’s left hoof because he either had a bad bruise on his coffin bone or was possibly showing signs of laminitis. As a natural optimist, I figured it had to be a bruise, besides he wasn’t acting lame and I just never thought laminitis could happen to my horse. Silly… I know. As you already know, this time my optimism didn’t pay of. As of yesterday we officially know that Aspota does have laminitis. After looking at his feet, Steve immediately asked if his diet had changed since the last time he was shod. It sure had. 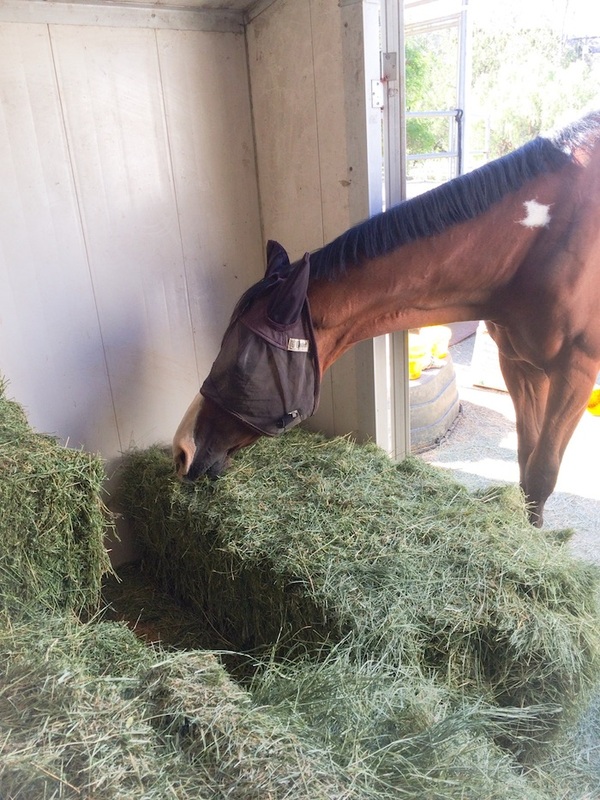 After a recent bad bout of colic we decided to give him less grass hay (which tends to provoke colic with him) in exchange for more alfalfa. Since we are also struggling to put weight on him we added Equine Senior to his diet too. As much as I was trying to help Aspota I was actually making an entirely new problem much worse. All of this protein could have very well lead to his outbreak of laminitis–or rather, inflammation of hoof laminae. 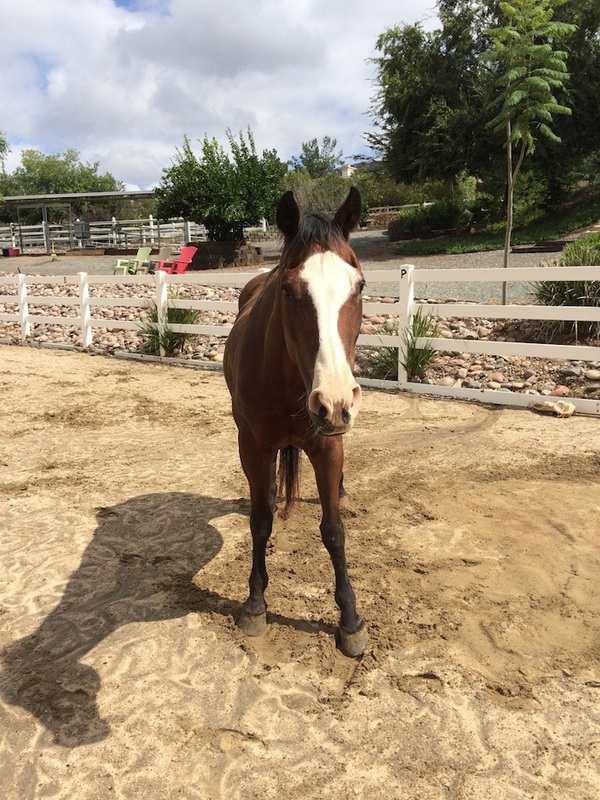 Laminitis and founder are two terms often used interchangeably, but as my vet explained, they are slightly different. 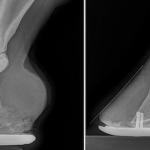 Founder is when laminitis becomes uncontrollable or persists for long enough that actual hoof damage, separation from the hoof wall, and rotation of the coffin bone occurs. Aspota doesn’t seem to be in any pain, but I worry everyday that’ll change overnight. Thankfully, at least there are things you can do to help prevent worsening of laminitis, such as to supply him with a diet low in sugars and proteins. Unfortunately, my little Aspota is a food-lover with a taste for the sweeter things in life, like alfalfa and equine senior. It breaks my heart that he’s officially stuck eating mostly grass hay pellets and orchard grass. I am on the hunt for other supplements low in protein and sugar he will enjoy, so he should have a new favorite food before long… even if I have to make it in the kitchen myself! I recently heard orchard grass tends to produce less instances of colic and it contains less protein—a win-win for Aspota’s complicated condition. I have the orchard grass ready to go, and I stocked up on grass hay pellets in exchange for his old 50/50 (half alfalfa/half bermuda) pellets. I also swung by my favorite little horse store Elstons and picked up Remission, which is a supplement rich in Omega-3 and Omega-6 fatty acids, as well as antioxidants and essential amino acids. I read awesome things about this product and the price is great so I am hopeful it will help. I gave Aspota his first dose of Remission today; I’ll keep you posted how it goes. The changes you need to make to your horse’s diet or lifestyle post-dianoses will vary based on likely causes, such as diet, weather, or underlying conditions like cushings disease.